10th Dan To 13th Dan In A Minute! Today Sensei was late for the class, so I was tasked to begin without him. It’s not the first time it is happening to me, but I must admit that I’m always proud of his trust. When he arrived, he continued with the Mutō Dori feeling and we played unarmed techniques, and sword and Bō variations. Some movements included Sannin Dori . The dôjô was packed, so long weapon moved were quite difficult to put into practice, but we managed. Sensei’s movements are so subtle that we put our intention on one point, and always get destroyed from another angle. But the Kaname of the day was not the class but what happened during it. At some point he invited a student to attack him. Apparently, it was the first time for him to Sensei’s uke. At first, he didn’t move. Then after Sensei asked him again to join him in the center, he turned twice to see who was being invited. Finally, still hesitating, he stood up. You could see the surprise and disbelief in his eyes. I spoke with him after the class and he told me that never, in his many years of training, he thought that he would be Sensei’s uke one day. That was cute. But the story doesn’t stop here. Maybe ten minutes later, Sensei seated at the other end of the dōjō, stopped the class, and asked him for his rank, country, and number of years of training. “Uke” still moved by his experience, looked lost again, and with a small voice. said “19 years, Germany, Jūdan “. The training resumed, then sensei sat next to him, and called Furuta San in. Furuta San came with pen and paper. Sensei turned to “Uke” and said: “13th dan! Furuta San, get his name and details”. You should have seen his eyes when finally he understood that he got promoted from tenth to thirteenth Dan in a few seconds. He was more lost than when he was invited to be Sensei’s uke. I’m always wondering what Sensei and the Japanese Shihan see that we don’t. This is the beauty of Hatsumi Sensei’s grading system. Ranks have little value if you don’t live up to them. But to be promoted in such a way by Sōke is a big honor. I’m sure his teacher will be proud, as I would be. When in Japan, when my students are promoted by Sōke, I always see it as some kind of acknowledgement of my teaching work. 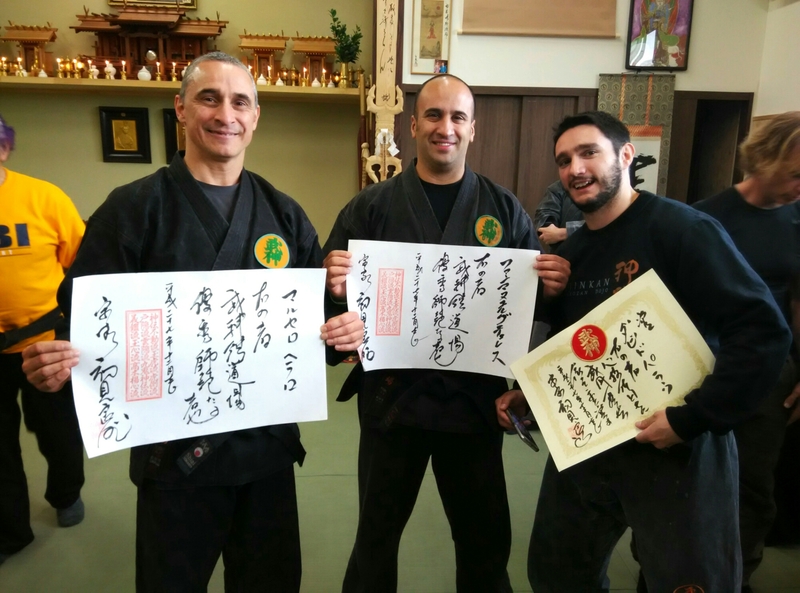 At the end of the class, Sensei rewarded three Jūgodan with the title of Yūshū Shihan and one with the Shingitai . (2) Then he spoke about ranks and rewards. “In the Bujinkan”, he said, “the title and ranks you received, are not given after but before you deserved it.” Too many practitioners seem to forget it. Ranks and rewards are given “a priori” not “a posteriori”. This is up to you to level your proficiency to be worth it. But the Shingitai diploma is the one I prefer. The Shingitai rewards the three levels of development of the student: Soul, technique, and body. (6) If it is quite easy to get Gi and Tai, Shin is the hardest. 1. In Latin “a priori” means before; and “a posteriori” means after. 2. Yūshū Shihan: Marcelo Ferraro (ARG ), Juan-manuel Gutiérrez (ARG ), Paul Fisher (USA). Shingitai: David Palau (COL). 3. Dai Shihan: Noguchi (JAP), Nagato (JAP), Senō (JAP), Pedro (SP), Paco (SP), Sven (SWE), Peter (UK), Arnaud (FR), Phil (USA), Par (USA), Jack (USA), Daniel (ARG). 4. Yūshū: 優秀/yuushuu/superiority; excellence. My understanding is that those two titles only differ in the level of potential responsibility. 6. 心技体/shingitai/(sumo) three qualities of a wrestler: heart, technique, physique. 技, Gi, is also read as Waza. Next Post Half A Million Views! Could someone explain to me, why it is necessary to go further than 10th Dan? Could someone plausible explain to me, why a 35 year old “BOY” is able to have 10th degree?? Could someone plausible explain to me, how it is possible and for what reason so ever, someone is able to skip “MASTER-DEGREE’s”?? This is the biggest nonsens in Martial Arts. The sad story ………….. it is done by one of the most respected Grandmaster on Earth. I don’t understand this World of Martial Arts anymore. Sorry, this all is crap!! I am not talking about the skills, but the grading system is a big joke Soke Hatsumi. This “nonsense” as you write, is not one; you have to get the “why” before judging. The Bujinkan has 15 ranks to symbolize the age of adulthood of the young Samurai. At the age of 15, the young Samurai was ready to be sent to the battlefield. One way to see and understand this ranking difference in the Bujinkan is the following. At Jugodan (15th dan), you receive your MD, but you have no life experience. Many people worship the piece of paper, don’t. It is a level that you might achieve one day. Remember that in Japan (not only in the Bujinkan, ranks are given “a priori”, not “a posteriori”. The rank you have represents your potential. Then it’s up to you to be worth the rank you have received. Bujinkan is not a sport, so don’t compare it with other sport ranking martial arts. “Dan” in Japanese means “level” or “step” (1). Did you know that other arts like Ikebana, Taiko, or Go have more than 15 dan? I hope this clarifies the subject.